Such microaggressions have been commonplace in the 11 years since Sheikh, who at the age of 29, sustained a rare spinal stroke injury that suddenly led to her losing the use of both legs. When, after a year in rehabilitation, she returned to work as a personal injury lawyer, Sheikh recalls being confronted with attitudinal barriers. “I found that after the injury, people had lower expectations of those with visible disabilities. People went from asking, ‘What do you do?’ to ‘Do you work?’… I found people were almost surprised that I went back to work in the first place,” she explains. These attitudes can, in part, be attributed to how disability is viewed in a mainly ableist society. “I realised when people are talking about diversity and inclusion, they aren’t talking about disability,” says Sheikh. She found this revelation surprising considering that disabled people compose the largest minority group in the world. Driven to put disability onto the mainstream diversity agenda, Sheikh left legal practice to pursue this new sense of purpose. “This massive life event forced me to ask difficult questions about what I wanted. In many ways, this is the worst thing yet best thing to happen to me,” she reflects. In 2015, Sheikh founded Diverse Matters, a training consultancy firm that uses workshops, tailored seminars and interactive events to give confidence to those with disabilities and support organisations striving to be more inclusive. The business, which Sheikh hopes to eventually take global, partners with a number of City law firms. Sheikh explains that in order to build an inclusive culture, law firms must master the four B’s: business, bias, behaviour and belonging. The first element involves stressing the business incentive for putting diversity on the agenda. Barriers preventing access for disabled people means there’s an underutilised pool of talent, which if tapped into, could yield greater profits for the firm, according to Sheikh. Law firms must also eradicate institutionalised unconscious biases, she explains, such as those found in recruitment practices that indirectly discriminate against people with disabilities during the application process. As a result, Sheikh has found applicants with non-visible disabilities, such as dyslexia, are nervous about disclosing their health condition to potential employers. To eradicate bias, firms must first change their behaviour, especially those associated with micro and macro aggressions, with the aim of creating a safe space that is inclusive to all. Doing so will then achieve a sense of belonging, encouraging disabled people to bring their authentic selves to work, rather than spend valuable time and energy compartmentalising their lives. “Fitting in is a hollow substitute for belonging,” Sheikh stresses. The real challenge to achieving industry-wide change is to convert those who are unmindful of the workplace barriers facing those with disabilities. Indeed, Sheikh admits to not fully understanding this bias and discrimination before her injury: “I was the first disabled person I’d ever met”. 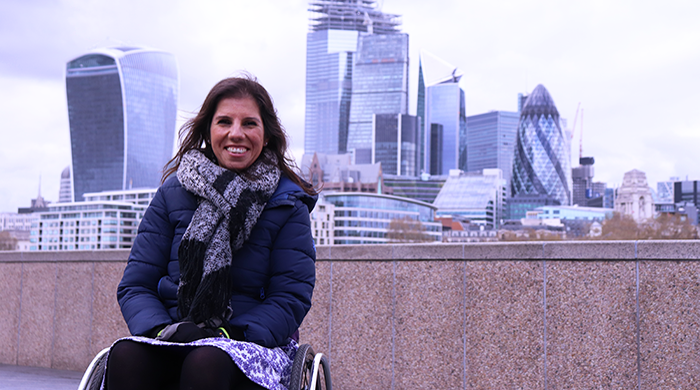 One way that Diverse Matters strives to overcome this is through the Wheelchair Challenge — an eye-opening initiative that involves senior leaders in organisations spending all day in a wheelchair. “These are people used to being noticed for the right reasons and not necessarily needing help, so there’s a feeling of vulnerability that they’re probably uncomfortable with,” Sheikh explains. The exercise is designed to give visibility to disability — raising awareness of the fact that every eight hours someone in the UK is paralysed by a spinal cord injury. But how does being an entrepreneur compare to life as a lawyer? “I miss aspects of legal practice, but I will always be a lawyer — no one can take that away from me,” Sheikh says. If anything, having spent 12 years delivering legal services to clients has offered useful transferrable skills. After all, being an entrepreneur is about seeing a gap and providing a service to fill that gap. Lawyers must be able to negotiate and argue on behalf of their clients — presenting a convincing case for disability and inclusion is no different, she adds. Yasmin Sheikh will be speaking during the morning session, ‘Embedding entrepreneurship into legal education and training’, at The Future of Legal Education and Training Conference 2019. First release tickets are available to purchase until midnight on Wednesday 17 April. General release tickets at full price will be available from 18 April. I dont know – I am sure it is annoying to be asked if youre okay, if you need help all the time from well meaning people, but perhaps a step too far to call it “microaggressions”. At the same time, law, like any industry with strong personailities, is vicious. Im sure there have been colleagues who have used these seemingly innocuous questions to subtly put her down. Having said all that, what is certain is that – it is brilliant to see Yasmin Sheikh progressing and excelling and clearing a pathway for other people to follow in. The trouble is that no-one knows what the right thing to do is now, so many people do nothing at all when help would be welcomed. Offering help is now a “micro-aggression” to some. Can someone please explain how to keep everyone happy? Buffin, thank you for your comment. Please see my reply below. I hope it helps. Thanks. Thank you, Anonymous (posted on Apr 11 2019 11:03am). Microaggession is a loaded term which doesn’t always help when discussing these issues. I prefer the term assumption. I have a permanent back condition; my suggestion that heavy case files be put at easy reach height was controversial, and I was told that I had to ask an admin assistant to fetch those out of my reach. And the rest. It’s all very dispiriting when you are managing a disability and are made to feel more reliant upon others than you need to be. Sorry not quite following you. Its a problem that other people need to be asked to get things for you? Notwithstanding that you shouldn’t be in the realm of paper files where everything should be a mouse-click away, I would relish having someone to get things for me. A little porter to attend to my daily needs would be delicious. We live in the UK where everyone is so reserved they won’t ask someone to back their car off their foot because they don’t want to inconvenience people. It’s a bloody shame that people who offer to help may be discouraged from ever doing it again by someone accusing them of being microaggressive. I am not encouraging people to never help again. I am just asking people to think about the assumptions they make about visibly disabled people. Check your own biases and question what you see and think about when you see a disabled person. Welcome to the 21st century…. Being helpful or benevolent is patronising. Being well spoken is stuck-up and out of touch. Being colour-blind is failing to appreciate diversity. Bit of a simplistic analysis. Listen to other people’s experiences. The debate is much more nuanced than this. But most people are quite simple, well meaning and nowhere near as intelligent as lawyers. Those of us who have never used a wheelchair could never begin to imagine how disheartening and patronising it is to have people assume you can’t do things without bothering to ask. Unconcious bias is a real problem, and though most people won’t admit it, they are surprised when wheelchair users are successful. It takes a very emotionally intelligent person to be able to look outside their own experiences, understand different types of people and really consider their actions all day every day. Most people just get offended when you challenge them on their bias. I’m sorry Yasmin that you have to deal with these microaggressions everyday but despite all this you are effecting real change for a lot of people, tackling both concious and unconcious bias and encouraging people to think outside of the box when thinking about diversity and inclusion. Thank you, JB. I appreciate your comment. What is encouraging is at least this article is starting a debate and I welcome that. I am open to learning more and listening to others and that’s what diversity and inclusion is all about. I agree that the term “micro aggression” isn’t a helpful term when well-intentioned people are offering to help. The dictionary definition is it’s term used for brief and commonplace daily verbal, behavioural, or environmental indignities, whether intentional or unintentional, that communicate hostile, derogatory, or negative prejudicial slights and insults toward any group. There is no hostility directed towards someone when you offer to help them and the intention is not to insult. I appreciate it’s often quite the opposite, in fact. This is what makes this so hard to explain to non-disabled people about the effect it has on you as you are at pains not to appear to be precious and also ungrateful for such help. Knowing what to do or say in these situations can be tricky. As a wheelchair user, I am not speaking for the disabled community, I can only tell you what works for me. I would advise others to not make an assumption and be too quick to jump in to “help” a visibly disabled person. They usually have it under control as do this every day. Remember you offering to help is one interaction in your day whereas for disabled people it’s many times during the day from different people and potentially over a lifetime so it gets quite exhausting and often feels like Ground Hog day when you are just going about your daily business. I am not just talking about pushing up a hill but sometimes just simply waiting for a friend can attract offers of help from strangers. I am not sure of what help I need in this situation. I am intrigued about the assumptions people make in this situation. I don’t think some people are used to seeing visibly disabled people out on their own and moving around independently. 1. Not to make an assumption that everyone needs help. 2. Be guided by others to take the lead. 3. Would you help a non-disabled person in that situation (i.e. opening a door)? If yes, then that’s fine, it’s called common courtesy. 4. If you see someone looking like they need help then a quick “you ok?” is fine. They’ll let you know. 5. If you feel you have made a mistake then listen to the other person (their response is usually based on a lived-in experience over years), learn from it and move on. 6. I don’t speak for all disabled people. This is what works for me. Others may have different views. Excellent article and much needed. Inclusivity is something that can seem alien in a competitive profession, but it should be at the heart of all good legal practice. I hope this article stimulates further conversations and reflections. simple well meaning soul who thinks they’re being helpful? Trust me, disabled people know this dilemma all too well as we pick our battles. I take into account so many factors before I decide whether to say anything. If you like, I carry out a risk assessment. Yes, maybe I overthink things but I always try to be kind, calm and appear reasonable as I know most of the time it comes from a good place. Not only would it sometimes be unkind to take someone to task every time but unnecessary. It’s not always good for my mental health to do so either as it can be mentally exhausting to deal with well- meaning people 6 or 7 times a day. As a disabled wheelchair user ( and single mother ) myself I admire you. There are many ways in which the world around us needs to change to actually become inclusive to disabled people. One another note , I ask would you consider taking up a legal case , one where by disability discrimination is main point . Obviously no details that could be disclosed in here . Please send me a private email yasmin@diversematters.org and we can go from there. Incredibly inspiring. As someone with a non-visible disability at the start of my legal career reading about strong & aspirational figures like Yasmin affecting change is great to see. Also comforting to know change is coming. A lot of city law firms claim to be inclusive and yet bemoan the need for flexibility & adaptations when it disrupts the prospect of a grad working a 12 hour day. And chambers seem less able to deal with junior barristers who come to the profession with a disability (from what I have observed). The legal profession (like all time intensive, high pressurised [particularly private sector/ finance based] professions) has a real problem in its treatment of people with visible & non-visible disabilities. I’m not writing this to be dour, but I’ve attended talks where chambers and solicitors talk & advocate for support of disabilities and yet when it comes to the practicalities of how to be inclusive I rarely see it being actioned. What I’ve come to realise and after reading this article am certain of: having an entrepreneurial spirit will be crucial to get anywhere. Thank you Yasmin! I agree with you that we have a long way to go to make workplaces inclusive for people with disabilities and health conditions. As so many disabilities are so different and a lot of the time the concept of inclusion is only understood when you have experienced exclusion, this makes it challenging for others to understand the issues. For this reason, it’s so important we talk about it to ensure disability issues in the workplace are on the agenda. As we’re an ageing population, 1 in 2 of us in our lifetimes will sadly have cancer (a disability under the Equality Act), a lot of us will be touched by disability perhaps indirectly by perhaps looking after ageing parents and it’s important that the legal profession is reflective of society and its diverse clients, this means workplaces will have to adapt to retain talent. I wish you all the best in your legal career.